Practical artificial intelligence has made its way out of the labs and into our daily lives. And judging from the pace of activity in the startup community and the major IT powerhouses, it will only grow in its ability to help us all get things done. Most AI solutions today are fielded by the big players in IT. For example, Apple’s Siri or the capabilities Apple embedded directly in iOS9, Google’s many savvy search solutions, Amazon’s very smart recommendation engine, and IBM’s Watson. Most of these firms seem to be on one of two paths: Success, which will mean being acquired by Facebook, Apple, Microsoft or IBM; or failure, which will see them acquired by the same firms for a lower price for their talent. Either way, the innovation continues. We are also on the lookout for hot firms that are not providing capabilities as part of other offerings or don’t seem to be on a path to be acquired by one of the big guys. This part of the market is very likely going to take off, since open-source platforms and open-cloud API’s and services are making it so easy for others to create and field AI. Siri: Part of Apple’s iOS, watchOS, and tvOS. Intelligent personal assistant. 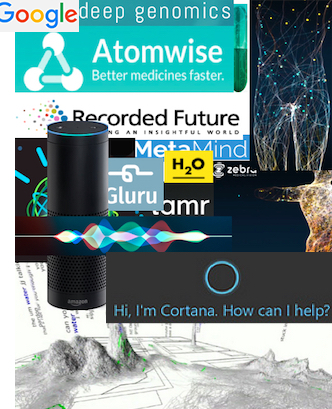 Cortana: Microsoft’s intelligent personal assistant. Designed for Windows Mobile but now on Android, and a limited version runs on Apple iOS. Also works on desktops and Xbox One. x.ai: Let AI coordinate schedules for you. Your own personal scheduler. RecordedFuture: Leverages natural language processing at massive scale in real time to collect and understand more than 700,000 web sources. Tamr: Unique approaches to Big Data, leveraging machine learning. Soar: a general cognitive architecture for developing systems that exhibit intelligent behavior. Prediction.io: a service with easy to use, open templates for a variety of advanced AI workloads. h2o.ai: Build smarter machine learning/AI applications that are fast and scalable. OpenCV: Open-source computer vision, a library of programming functions aimed mainly at computer vision. OpenCog: An open-source software project whose aim is to create an open-source framework for artificial general intelligence (AGI). Enlitic: Deep learning for healthcare and data-driven medicine. Metamind.io: Automatic image recognition with many use cases, including medicine. Flatiron.com: AI and machine learning delivering insights on treatments. Mttr.net: Building flying vehicles powered by intelligent software. We know this is not a complete list. Please let us know who you think we should include. Contact us here. Bob Gourley is a Co-founder and Partner at Cognitio and the publisher of CTOvision.com and ThreatBrief.com. Bob’s background is as an all-source intelligence analyst and an enterprise CTO. Find him on Twitter at @BobGourley.